Born: February 4, 1841 in Falmouth Ma. Died: September 2, 1873 in Lynn Ma. 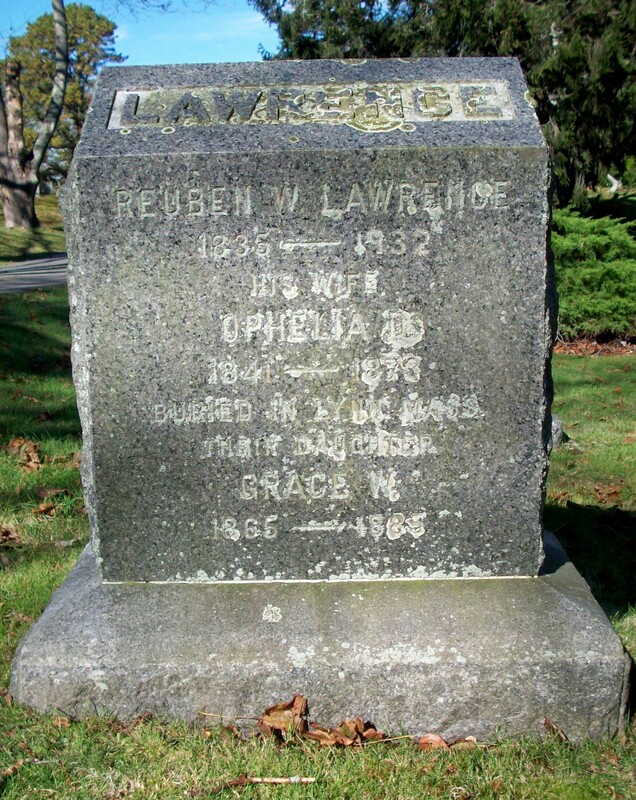 at 31 yrs, 6 mos, 29 d.
To: Reuben Wats Lawrence; (1835 – 1932) (Edward Doty Lawrence & Elizabeth Brown Howard); Reuben married (2) Ann Louisa (Fish) Howard (1837 – 1920) (Isaiah Fish, Jr. & Caroline Fisher) in Bourne Ma. on December 31, 1903; Ann married (1) Charles Foster Howard (1827 – 1892) (Calvin Howard & Hannah Handy) in Sandwich Ma. on November 29, 1857. 1. Edward Jason Lawrence; (December 1, 1863 – April 8, 1938); Married Lena Hennes (1873 – 1964) (Isaac Newton Hennes & Harriet S. Berry) in Pacific County Wa. on January 3, 1894; Edward, a carpenter, died at 74 yrs, 4 mos. ; He is buried in Cataumet Cemetery (headstone not located). 2. 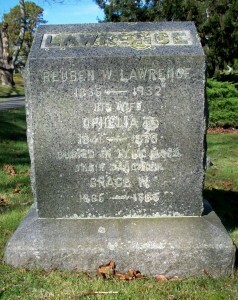 Grace Wing Lawrence; (July 26, 1865 – June 23, 1885); Grace died by suicide at 19 yrs, 11 mos. ; She is buried with her parents in Cataumet Cemetery.